Spring has finally arrived and many Granges are gearing up for the work that lies ahead. April is Grange Month. All Community Granges should have received a packet from National Grange containing information to be used in conjunction with this celebration. Does your Grange have activities planned for this month? How about an open house, inviting the public to attend and explain the benefits of Grange membership. Will you advertise your plans in your local newspaper to let as many people know as possible? This is the ideal situation to help attract new members. SEIZE THE OPPORTUNITY. An important event in April is the clean up at Camp Berger on the 26th. I hope to see many able bodied Grangers there to help. Come early so we can accomplish all that needs to be done. After the clean-up Winchester Grange will be having a supper for all for the nominal fee of $3.00. This will be around 4:00 P.M.
Our Pink Sash meeting will follow. I realize that all Pink Sash wearers will not be able to attend, but for all coming to the dinner please contact Todd Gelineau so the staff at Winchester Grange will know how much food to prepare. Don’t worry if you don’t contact Todd, there should be plenty of food, but a rough idea of how many to expect will be helpful. The dinner and meeting is not just for Pink Sash people, but for all members interested in what is going on in the State Grange. Sister Marge and I attended a meeting of State Masters in Irving Texas in February. The new National Master and staff presented some very interesting and informational workshops. Brother Ed Luttrell told us of the direction in which he hopes to move the Grange. He has some great ideas and some ambitious plans. I will discuss these, as well as the workshops, at the Pink Sash meeting.. 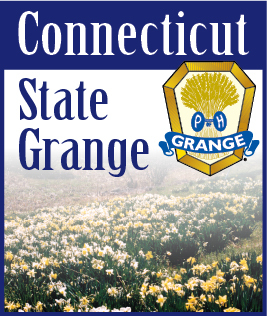 Specifically how these plans can benefit us in Connecticut and how we can move our State Grange into the future. I plan to devote a portion of the meeting to the 2008 Hosting Committee so you will know the progress they are making. I know many of you have questions as to what is happening and what those of you who have volunteered will be doing. Well this will be the time to find out. As you can see April holds many possibilities for you and your Grange. It is up to you to take advantage of them. The biggest change it will bring for us is in the weather. Enjoy it.